We spent New Years with my family this year. Two weeks before our arrival my dad had the flu. During our stay my mom got sick with what may or may not have been the flu. Needless to say we were all paranoid and slightly scared. Days before our trip the hubs and I were drinking echinacea tea and taking Emergen-C once a day. I was also pumping us full of fruit and veggies. (Not that we shouldn't be doing this every day...we try.) In my searching of healthy, preventive measures for being exposed to the cold and flu season I ran across some really helpful information from The Healthy Chef. Tumeric. Do you know about it? I didn't. At all. As soon as I red about it I knew I needed to cook with it. And I've never cooked with fresh ginger either and wanted to do that. At the bottom of the article I read were some really yummy sounding recipes. The chicken soup was at the top of my soup list. I've never made anything like this before and I'm so glad I did! So, now I'm sharing it with you guys. Maybe it was all in my head...maybe this soup along with the other good things we were doing really worked. But thank the good Lord we have not gotten sick. Yet. 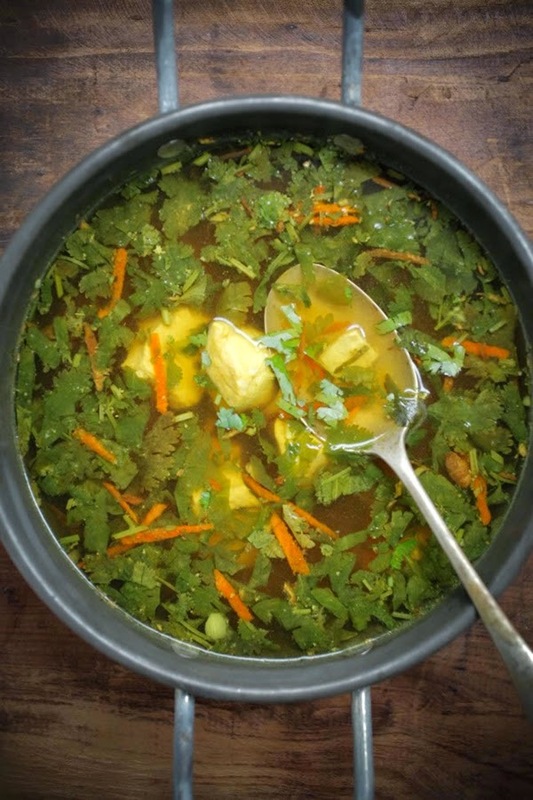 Combine the garlic, turmeric, ginger, stock, water and chicken into a large pot.Simmer for 5 – 10 minutes over a low heat until chicken is cooked through and flavours have infused into the stock.Add mirin, tamari and coriander just before serving.Serve in large bowls and sip slowly. Enjoy. Notes:Vegetarians can use vegetable stock in place of chicken stock and use my lane kluski or organic silken tofu in place of the chicken to boost protein.For lane kluski (polish for egg noodles) beat 2 eggs and pour in a thin stream over the simmering stock for the best egg noodles you’ll ever eat.Fresh turmeric is available from your local grocer. if using dry then only use 1/4 teaspoon but fresh is best for it’s anti-viral properties.Other vegetables can be added if you like such as shiitake mushroom, spinach, kale.A little chilli or my XO Sauce can be added for a little heat.This soup only takes 10 minutes to make, which is why chicken breasts are used.Obviously you can make this soup using a whole chicken, using all of the stock and removing the tender meat from the chicken then stirring through the stock before serving. This will take approx 1 1/2 hours.